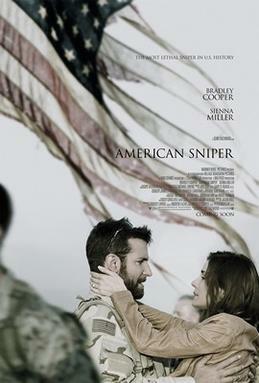 ‘American Sniper’ is a film about America’ most lethal sniper, with over 160 confirmed kills across 4 tours in Iraq. The script had been linked to numerous directors (including Steven Spielberg) and actors, before eventually reaching production with Clint Eastwood in the director’s chair, and Bradley Cooper starring as Chris Kyle. The film spends most of its runtime jumping between Kyle’s tours in Iraq and his life at home with his wife (Sienna Miller) and kids, bookended by scenes depicting Kyle’s training for the Navy Seals, and his work supporting veterans after he left the armed forces. I believe the idea between showing the two main aspects of his life (war and family) was to create a contrast between the two experiences, but the lack of character development at the outset starts to cause problems here and we don’t get anything more insightful than the clear impression that this is a man who is uncomfortable away from the frontline. Bradley Cooper is excellent as Kyle, but the writing of the character poses problems that he can’t overcome. His motivation for going to war is thin and doesn’t delve deeper beyond ‘I want to protect my country’, and that makes it difficult to get a handle on Kyle. Every thought and feeling is internalised, but when you want to make a character piece, we need to understand what makes the main character tick. This creates problems for the film, as beyond Miller (who is away from the action), we don’t get an insight into any other character, which means any deaths feel hollow and the film struggles to fully invest me in the situation. The viewer is watching as an outsider but a truly great war film makes you feel part of the action, and makes you feel every moment of danger. The action scenes are shot with a nice intensity, and Eastwood’s best pieces of direction come in a couple of scenes involving young kids, where Kyle is forced into an incredibly tough decision. There’s a great theme to explore here around the morality of a man who is fighting for his country, but is ultimately a killer responsible for over 160 deaths, but we rarely get any insight into this. One of the interesting things the film does is to essentially pit Kyle against an enemy sniper who seems to be picking off US soldiers. This gives the film another dimension beyond your typical war film, but I’m unconvinced by the choice to almost portray the enemy sniper as a superhero, jumping between buildings and slipping away from the US (also not sure what the nod to the photo at a medal ceremony was, given its not referenced elsewhere in the film). We can understand Kyle’s determination to get this guy, but the analysis and motivation never goes deeper than this, when there’s an interesting opportunity to explore the contrast between the two men with similar skills. It’s a particular shame coming from Eastwood, who directed ‘Flags of Our Fathers’ and the superior ‘Letters from Iwo Jima’, portraying two sides of a conflict with equal weight and consideration, and we know he’s capable of better. There are a couple of further things to comment on surrounding the film and the response from the critical community, with the first perhaps being more to do with my lack of understanding of how the army behaves in a wartime environment. Surely army personnel don’t spend time on the phone to their partners when they’re travelling through a warzone, or when they’re on top of a roof trying to spot signs of danger from the enemy? Perhaps this is the case (and the film is based on a true story), but it seems a ridiculously dangerous practice that can’t be good for both parties on each end of the phone line. Secondly, I’ve seen many polarising reviews either praising this film to the hilt or destroying its credentials, and when you read these reviews it’s clear to see many reviewers seem unable to judge the film on its own merits without letting their political feelings cloud their judgement. This is neither a great film, nor a terrible one, and it’s a shame so many critics seem to have their mind made up before entering the cinema screen. I’m a great believer in the ability to enjoy a film on its own merits, whether you agree with the politics behind it or not, and ‘American Sniper’ seems an appropriate film to raise this issue in my review. ‘American Sniper’ is a satisfactory war movie, with a good performance from Cooper and some superbly intense moments, but it fails to really get into Kyle’s head and it suffers as a result.